The history of Palestine and Israel is based on representations, on images and visual clichés. Among all the accepted symbols, only one is shared by both people: the orange. Through the story of Jaffa's oranges, the history of this land is told, a tale that is beautiful and heartrending. Jaffa’s orange is one of the symbols that helped build the Zionist discourse about Palestine: a “desert we have made bloom”. Based on photographic and cinematographic documents, some going back as far as to the 19th century, Eyal Sivan’s film shows the orange groves at a time when Arab Jaffa was one of Palestine’s most populated and thriving cities. From the picking of the fruit to its packaging before exportation, the orange was a source of revenue for thousands of peasants and workmen, not only from Palestine, but from Egypt, Syria and Lebanon too. Jews and Arabs worked together in the orange groves. These images were progressively replaced by socialist realist images, Israeli style, depicting labor and songs, emancipated women in shorts, etc. : it was the spreading of the “Jewish Labor”, the socialist call to action, excluding the Arabs. In 1948, Jaffa was ruined under the bombs and most of its population was gone. Jaffa’s orange then became the symbol of an Arab-free Israel. 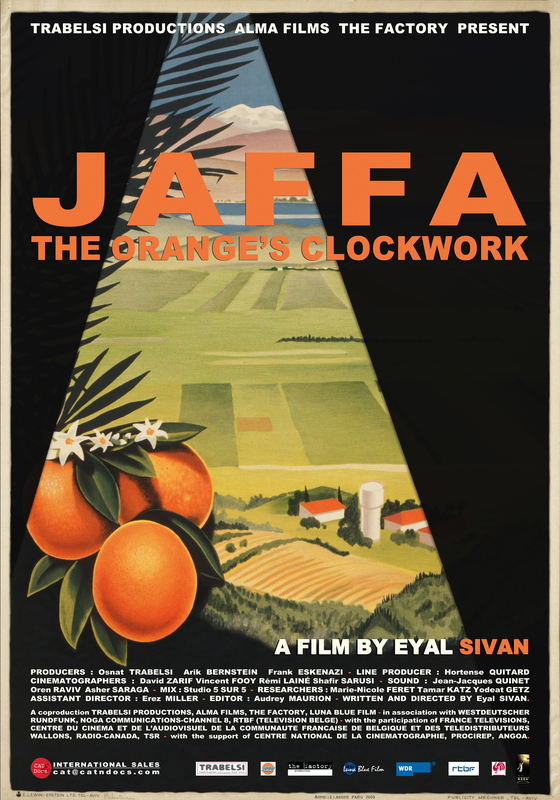 An international advertising campaign imposed the name “Jaffa”, like a trademark, concealing the city of Jaffa, its more than a hundred-year-old orange groves, and the history of the Jewish Arab cooperation over this legendary fruit. Le message d'une colonisation qui apporterait le progrès dans un monde de désolation se trouve tourné en ridicule. (...) Le film mérite d'être vu pour les questions qu'il suscite chez le téléspectateur. The message of a colonization, meant to bring progress to a world of desolation, becomes an object of ridicule. (...) The film is worth seeing for the questions it raises in the viewer. Un travail de mémoire remarquable. A remarkable work of memory. L'un des intérêts de ce film réside dans la palette des personnages interrogés. (...) Tous apportent un vibrant témoignage sur la vie à Jaffa, avant que les oranges ne deviennent le symbole du renouveau d'Israël. One of this film's interests lies in the pallet of interviewed people. (...) They all tell a vibrant account of life in Jaffa before the oranges became the symbol of the New Israel. Avec Jaffa, la mécanique de l'orange, Eyal Sivan dévoile par une métaphore un siècle d'histoire israélo-palestinienne. With Jaffa, the Orange's Clockwork, Eyal Sivan uncovers, using a metaphor, a century of Israeli-Palestinian history. In order to tell us this « orange's clockwork » and the taking-over of Jaffa, Eyal Sivan puts on the screen a multitude of images and representations and gives voice to many Palestinian and Israeli interlocutors, historians, writers, researchers, workmen… An outstanding work around archives, photographs, paintings, videos, and powerful testimonies.